Welcome to our very special book store! Thanks for dropping by. Sit back. . . take a deep breath and relax. Enjoy browsing from book shelf to book shelf as you sift though the many wonderful books we have choosen to be featured in our book store. Here you will find reviews and recommendations on many topics written by some of the best authors and professional speakers in the U.S.A. NOTE: There are currently 49 book shelves in all - more will be added as our book inventory grows. Click "next" or on a book shelf number at the bottom of each page to browse back and forth to each book shelf to view more books. The books presented in our book store are personally selected, reviewed and recommended by Larry James. Each book is carefully screened for the kind of content that can contribute significantly to the quality of your relationships and other equally important areas of your life. For a complete selection of books by Dr. Phil McGraw, browse the Dr. Phil Book Shelves in Larry's Book Store. Special book shelves featuring the books of Dr. Wayne Dyer, Guy Finley, Dr. Deepak Chopra, M.D., Marianne Williamson, the complete works of Jim Rohn, America's Foremost Business Philosopher, and Dave Ramsey, financial guru are available. We are proud to present the complete works of America's Business & Success Guru, Brian Tracy. There are 4 shelves of books and 9 shelves of audio & CD programs. The video shelf is under construction. Looking for books about weddings? Click here for the wedding book shelves. The Children's Book Shelf currently features seven wonderful books in the "The Adventures of Andi O'Malley" series by Celeste M. Messer. The Alzheimers Book Shelf - Click here for a listing of over 100 books about Alzheimers Disease. Visit the "Mary N. Jarvis Memorial Book Shelf" in honor of Larry's mother. There you will find numerous links to other sites which feature information and articles about Alzheimers Disease. Attention: Authors & Speakers - There is a special section in our books store that features books exclusively for Authors & Speakers. Networking Books Section - A special section in our book store for people who are serious about developing their networking skills, both personally and professionally! For articles about networking, click here. Books about HIV and AIDS, plus facts and links! A friend and her young son, Reid, were browsing in a large bookstore. Engrossed in making a selection, my friend had lost sight of her child. "Reid!" she called out, noticing the boy was missing. "Reid!" Just as she spotted her son in the next aisle, she bumped into another customer. "Pardon me, ma'am," he said, "but most folks come here because they already like to read. No sense wasting your time trying to convince them." Check out "The Music Shelf" featuring the music of Nashville's newest and brightest star. . . Jana Stanfield and stunning composer/performer. . . Karie Hillery and Nashville performer/composer. . . Carol Grace Anderson. . . Norwegian born singer/motivational speaker. . . Cecilia, David Modica, and one of my favorite's, Chris Rice. You may purchase any of these books, music CDs, DVDs and videos at significant discounts from the "secure" websites of our online book store partners. Larry's Video Store features the "Top 100 "Romantic" Movies". Whoops! One more "important" thing. . . if you would like to send personal notes to authors featured in our book store, you will find many of their mailing addresses and a few e-mail addresses listed in our Author's Personal Address Directory. 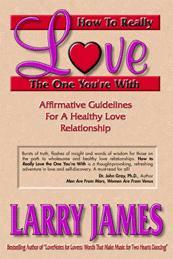 How to Really Love the One You're With: Affirmative Guidelines for a Healthy Love Relationship - Larry James - As seen on ABC TV's "The View" with Barbara Walters. Truly an excellent guideline for your relationship. More info. LoveNotes for Lovers: Words That Make Music for Two Hearts Dancing - Larry James - This book is a collection of reflections on the many aspects of relationships. Each one is a mini-lesson in love. Each time you reload or refresh the more info page you can read another LoveNote from the book. Red Hot LoveNotes for Lovers - Larry James - It's HOT. . . and tastefully written. A terrific guide to physical intimacy! Each time you reload or refresh the more info page you can read another Red Hot LoveNote from the book. The First Book of LifeSkills: 10 Ways to Maximize Your Personal and Professional Potential - Larry James - This book is devoted to the process of helping you develop close personal and business relationships that work. Review a different chapter each time you reload or refresh the more info page. If you have read any of Larry's books, write your own book review! NOTE: Click "next" or the number of the book shelf to browse back and forth to each book shelf to view more books.